Talented six-string master Ethan Brosh will be unleashing album #3 on February 16th. 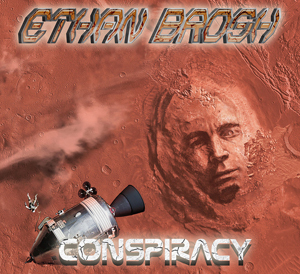 Titled Conspiracy, the album’s 14 new tracks showcase Brosh’s stellar guitar work in the style of hard rock guitar instrumentals, which perfectly balances virtuoso playing and memorable melodies. The album also features the world class players in THE ETHAN BROSH BAND. Additionally, a special guest solo from STEEL PANTHER's Satchel is featured on the tune “Tomb Of The Gods”, as an exclusive on the album version. An album preview can be viewed/heard below. Full album pre-order and a PledgeMusic pre-order (https://goo.gl/abAEPC) will also begin, which includes exclusive limited autographed vinyl test pressings,exclusive bundles and VIP concert experiences. And shortly after Conspiracy drops, Brosh will hit the road in support of the release, including dates with the one-and-only Ross The Boss. “I can't wait to get on the road with Ross The Boss this March!! My band and myself have been hungry to get back on the road and do another big tour with lots of cities in it. We are very much looking forward to coming back to some of our favorite places to play where we have a lot of fans and friends. Sellersville, PA is a place we can't wait to get back to, as well as Quebec City, and Toronto and Ottawa by now almost feel like a second home for us. We are psyched to finally get to play Montreal and also go far out to the west coast of Canada for a bunch of shows. Also, the west coast in America is long overdue and last time I toured there with my band was 5 years ago when we supported Yngwie Malmsteen. It's time to go back! This tour is also the first tour to support Conspiracy, and I can't wait to start playing the new material and have the new look and all that fun stuff!"